Obesity is the result of following a bad diet combined with limited physical activity. The car, escalators, television, computer, video games are daily habits that “steal” time from physical activity. Children, who spend on average 4 hours in front of the TV or computer monitor daily, weigh more (have a higher BMI) than children who watch less than 2 hours / day. Children less than 2 years are not recommended to watch any TV, while over 2 years to watch less than 2 hours a day. The international recommendations for health education recognize physical activity as a key factor in ensuring good health and suggest its inclusion in everyday life as a way of life. They recommend at least 60 minutes of moderate to intense exercise per day (even cumulatively, i.e. 3 sets of 20 minutes) for all children over 2 years, particularly emphasizing the importance of pleasure and fun while exercising. The specific duration and frequency of physical activity promotes healthy growth and provides significant physical, mental, and social benefits. 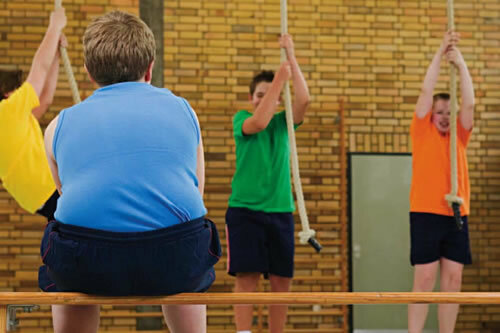 More specifically, a training program 40 minutes / day, 5 times a week for 4 months in obese children can improve the components of the metabolic syndrome, including the proportion of fat in the body. It is important to note that these benefits are maintained and kept as long as you keep exercising. Although physical activity alone may not lead to significant weight loss, the psychological benefits of exercise are very important. Improved psychological parameters may help obese kids to better manage overeating and negative emotions. From the above, it is clear that regular exercise has many psychological and physical benefits for the child, so parents should motivate their children to be physically active. To accomplish this, you first need to limit the time spent in sedentary activities (e.g., television, computer, console games). Then, you should encourage them to participate in outdoor activities that involve movement (e.g., basketball, dancing, etc.). You need though to let them choose for themselves, perhaps with the guidance of a trainer, what they prefer based on what is fun and what they like to do. You need to explain to them that the goal of doing sports is not to win but to participate and give your best performance. Non-formal exercises can also help increase your child’s physical movement. Riding their bike, playing in a nearby park, walking the dog are pleasant habits for the child who don’t want to leave the couch. Even some of the classic outdoor games like hide and seek, skipping ropes, rubber and apples are very good opportunities for exercise. It is good to find a suitable activity for each season. E.g. swimming in the summer, hide and seek in the winter, music and dance at home. The involvement of parents in this process is always an incentive for the children. It is well known that the child seem to replicate the behaviour of their parents. Parents should be physically active as well and why not do the same exercises with their children.